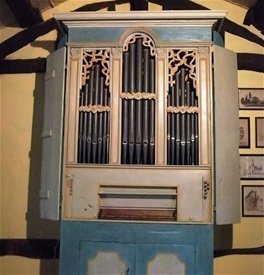 In 1963, F.Chapelet got a studying organ built by Pierre Chéron. 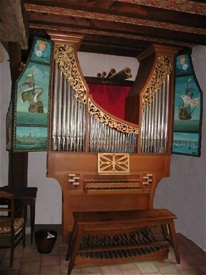 In 2008, F.Chapelet buy another organ to M.Formentelli and makes it restored by this organ-builder. This instrument is dated and signed : 1785 by Luciano D'Onfrio, on the rollerboard. Bought at an antiquarian by Michel Formentelli, this organ comes from a patrician home. It contains all his original material. Painting was cleaned and revived. When the doors are closed, they would say a large press. This organ was scrupulously restored. The sounds are very soft but clear, what is just necessary for a great living room. The organ is inaugured on December 10th 2009 in its personnal home in the presence members of the Association and other friends. One keyboard with 45 notes and brocken octave. Little pedal with 9 notes in permanent pull down pedal. 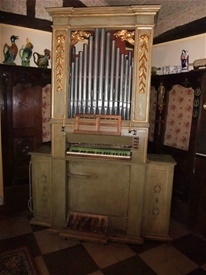 In february 2012 Francis CHAPELET buy a little Italian organ to Michel Formentelli. It is dated from 1660. It countains all his original material. One Keyboard with 45 notes and brocken octave. Little pedal with 9 keys in permanent pull down pedal.